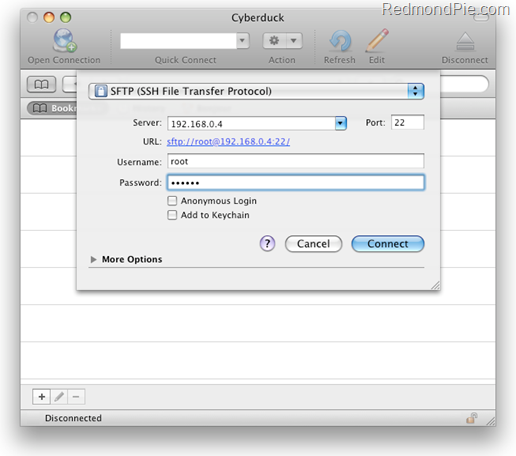 The following step-by-step guide will help you enable full Internet Tethering option in iPhone 3G and iPhone 3GS running the new iPhone firmware 3.1.2. Last week we posted a method to enable Internet Tethering which relied on a third party app called MyWi. While that method was good, the downside to it was the price tag that it carried. But now with the following guide based on the hack found by Dev-Team, you can enable Internet Tethering without having to pay a penny for any third party app. Note for Windows Users: This guide is for Mac OS X users only. Windows users can follow the alternate guide posted here. Note for iPhone 2G Users: To enable Internet Tethering, iPhone 2G users should follow the alternate guide posted here. NOTE: The following procedure requires a jailbroken iPhone running on firmware 3.1.2. Follow the step-by-step guide posted here in order to jailbreak your iPhone (3G and 3GS) on iPhone firmware 3.1.2. 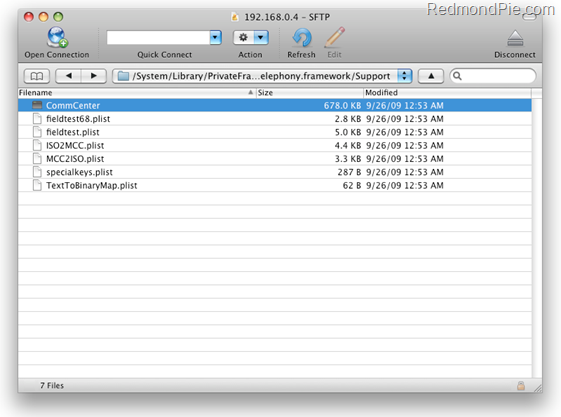 Step 2: Move the downloaded CommCenter.patch file to your desktop. Open Cydia. Touch on “Search” tab and then search for “OpenSSH”. Install “OpenSSH” and reboot your iPhone. Step 4: Connect your iPhone with your computer. Make sure iTunes is not running. Step 6: Navigate to /System/Library/PrivateFrameworks/CoreTelephony.framework/Support/ and copy “CommCenter” file to your desktop. A new file named “CommCenter-hacked” should now be created on your desktop. 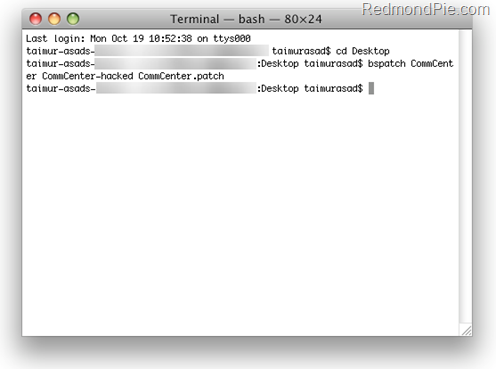 Step 8: Rename this “CommCenter-hacked” file on your desktop to CommCenter. NOTE: Make a backup copy of the original CommCenter file on your iPhone so that you can restore to it in case something goes wrong. Step 10: Restart your iPhone. Voila! 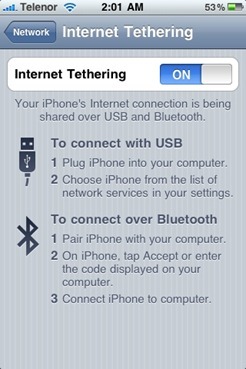 you should now have official Tethering option under Settings –> General –> Network on your iPhone 3G and 3GS. UPDATE 1: Those of you who are not getting Internet Tethering option in Settings –> General –> Network should browse to http://www.benm.at/help/help.php on your iPhone and install a new mobileconfig. UPDATE 2: Native MMS functionality in Messages app on iPhone 2G can now be enabled using the step by step guide posted here. UPDATE 3: Those of you who are having issues enabling both Tethering and Visual Voicemail (VVM) on iPhone 3.1.2 firmware should follow the steps posted here in order to fix this problem. Ask me any question should you run into problem in enabling Tethering on your iPhone running firmware 3.1.2. Disclaimer: Use this guide on your own risk. Your carrier may start charging you for unauthorized tethering access. on restart after having done everything my iphone stays locked at the apple and won’t finish starting up. After about 5 minutes it restarts and keeps doing this over and over again, any help? hey guys is there any way to tether using a jailbroken iphone 3g 3.1.3 to tether if so will following this method on this page work for me ? wow i think this is amazing way to thetering iphone. thanx dude.. Follow the directions above. Minus the bspatch section. Do make a copy of CommCenter. Don't run bspatch and you'll be good to go. Works for me as well! Anyone know how to do this with windows? sorry after following all steps and restart my iphone. its never work for me. I have tethering enabled and it shows up as local area connection 2 with a cable unplugged on windows 7, what am i missing? Can you use this hack on international carriers? I'm in Costa Rica using ICE (Costa Rica's only cellular service). They support tethering, but I'm hesitant to install the hack on my iPhone if it only works with AT&T, and don't want to risk a necessary reformat. my 3GS just keeps rebooting after this mod, what should I do ? Do not attempt to do that on 3.1.3. It kills your phone and you have to do a full restore after that in order to get your phone back. Wait until patch for 3.1.3 is released. I tried twice before I learned my lesson. This process wound up blowing out my phone, and I'm afraid it's totally bricked… My phone gets stuck at the Apple logo on boot, but I can't get it into recovery mode, DFU mode, etc… I've tried holding power and home for various lengths of time, holding home alone as the phone powers on, cable in, cable out… There's a ton of different noise on the web about what you're supposed to do to get your phone into recovery mode. Nothing seems to work… I can't get the “Please Connect to iTunes” screen no matter what I try. Any ideas? i love the way the windows instructions lead to a guide on how to install mywi, totally annoying after reading your first paragraph about not paying to use mywi. Why dont you say this in the link rather than annoy people with such a lame redirection link? Pay the $10 for mywi… Works and easy. Geez.